A few weeks ago I stitched this little pansy freebie and on the other side I stitched the word "spring" and a bee from the Marjolean Bastin Four Seasons piece. I hand finished this little fob and sent if off to my friend Sonja in Germany. The pictures shows this little fob attached to a new pair of Dovo scissors that I bought myself from Crewel Jewels. I recommend them for great service. I also got this other pair at the same time. Thanks for looking in on my corner of the web. Hi Julianne -- wow those Dovo's are really beautiful. What a sweet scissor fob too! So pretty! You are a very talented girl! That's a lovely scissor fob for your friend and the scissors looks great. Love that purple pansy. And ooh, the scissors are divine! 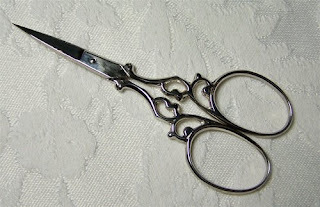 What pretty scissor fob and very lovely scissors. A lovely spring gift, its gorgeous. I have a pair of those gold scissors too, they are ultra sharp!! This is just soooo pretty! It totally says "happy spring!" Lovely fob! I like those scissors too! Goergeous fob Julianne, is the chart available on the Internet? Lovely scissors too. Thanks for your e-mail, will reply soon. this is lovely. nice works. very nice fob and scissors, you did a great job ! !